Locate the position that best matches your skills and interests with Staffing Network / QPA! We are a full-service recruiting firm specializing in the recruiting and staffing of light/skilled industrial and business professionals. For over 50 years, we've been working with many top employers, who are seeking talented professionals, like you, for a wide variety of permanent, temporary, temp-to-hire, and contract positions. Whether you are looking to get a new job, move up the corporate ladder, re-enter the workforce, get more experience, or just gain more control over your schedule, we will find the opportunity that’s the best fit for you! Our dedicated recruiters do more than look at your resume, they take the time to get to know you and understand your career goals. At Staffing Network / QPA, we don’t just fill positions, we help you take your career to the next level. Many of the positions we work on are not available through other recruiting firms. That means when you partner with Staffing Network / QPA you have access to jobs that you will not find anywhere else. 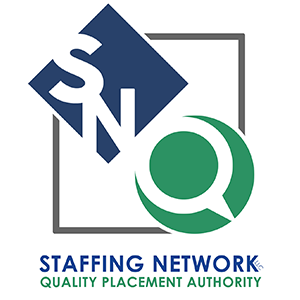 Join the Staffing Network / QPA Talent Network today and check out our current opportunities!